The race re-started after three laps with Hamilton attacking Raikkonen for the lead after a ‘racing incident’. 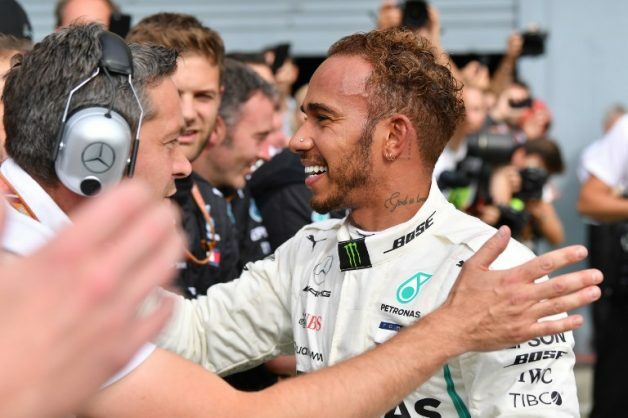 Championship leader Lewis Hamilton delivered one of his greatest races Sunday when he wrecked Ferrari’s homecoming party as he stormed to a record-equalling fifth Monza victory in his Mercedes at the Italian Grand Prix. The defending world champion produced a perfectly judged race of raw aggression and astute tyre-management to finish 8.7 seconds ahead of Kimi Raikkonen, who on Saturday had claimed pole position for Ferrari with the fastest lap in Formula One history. His 68th career victory and sixth this year enlarged his championship lead from 17 points to 30 ahead of Sebastian Vettel, who finished fourth in the second Ferrari after spinning on the opening lap after a clash with the Briton as he passed him at the second chicane. Hamilton’s Mercedes team-mate Valtteri Bottas came home third ahead of Vettel with Max Verstappen taking fifth place in the classified result, after finishing third on the road, following a time penalty. Hamilton’s fifth Italian win drew him level with seven-time world champion Michael Schumacher in the record books. Romain Grosjean finished sixth for Haas ahead of Esteban Ocon and his Force India team-mate Sergio Perez, Carlos Sainz who was ninth for Renault and Lance Stroll of Williams. The Italian Grand Prix was slowed to run behind a safety car on the opening lap Sunday after Vettel spun at the Roggia chicane following a clash with Hamilton’s Mercedes. Pole-sitter Raikkonen made a good start and led for Ferrari as Vettel was attacked behind him by Hamilton, who took the outside line going into the chicane and found the pace to move narrowly ahead. Vettel appeared to touch Hamilton as the pair battled for second place and then spun. He kept his car running and rejoined 18th with a damaged car. “That was silly, where did he want to go?” said Vettel on team radio. The race re-started after three laps with Hamilton attacking Raikkonen for the lead and the stewards concluding that the battle for the lead had been “a racing incident”.